Two weeks ago, my colleague Wilson Rojas Bugueño talked about an interesting class project that one of the Kirkwood faculty, Shelby Myers-Verhage, has her students work on in a college writing course. Shelby is an Associate Professor of English at the Kirkwood Community College campus in Iowa City and she is also a Professional Development Fellow at KCELT. senior citizen at a senior community to collect their stories and do some collaborative writing with them. 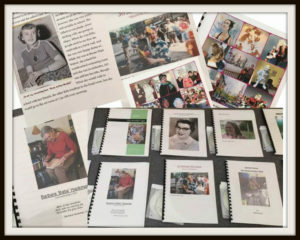 Students record and transcribe the senior’s voice, and take the responsibility to reflect and write those stories using their writing skills while they remain honest to the senior’s life stories. The final project is a book that is professionally printed with a spiral bound and a CD that is attached to the back cover. The CD includes interviews, scanned images and a digital copy of the printed book. Students experience a different setting in this project that sometimes changes their life path, and seniors sometimes feel more comfortable to share the stories of their lives with a young student! It’s a valuable experience for the families of the senior citizens, the community, and the students. The video included in this post is a brief introduction to the life stories project that includes Shelby’s and her students’ challenges and thoughts. If you like to know more about this project you can contact Shelby Myers-Verhage.